Anoola D183 Ivory Dress with Contrast Sleeves and Collar. A stunning shift style midi dress with 50’s inspired raised collar detail at the neckline. The contrasting fabric on the collar and sleeves gives a subtle sparkle to a beautifully understated outfit. Perfect elegant choice for Mother of the Bride or Groom. John Charles 26572A blush a-line dress. Features soft crepe fabric with an a-line shape and high neckline with 3/4 sleeves. Pretty floral illusion embroidered detail on the sleeves and shoulders with beaded waist detail. Irresistible IR4026 cowl drape front dress. Features soft cowl drape front with waist pleating for a flattering shape and 3/4 sleeve. Simple yet chic Mother of the Bride or Groom dress. Irresistible IR4012 cobalt lace applique dress. Features lace applique detailing on sheer sleeves and bodice. A ruched waist and skirt will flatter the figure and the neckline is asymmetric sheer with 3/4 sleeve. Gabriela Sanchez 6700 pale blue feather cuff dress. A touch of Hollywood glam and a dress of contrasts for the Mother of the Bride/Groom. Features sot crepe blue fabric in shift shape to the knee. A wide v neck style and embellished beaded cuffs with feather trim. Gabriela Sanchez 6614 bow detail peplum dress. Features gold brocade top with sheer effect sleeves and round neckline. Over-sized bow detail at front with peplum over-skirt creating shape. A very stylish and contemporary Mother of the Bride or Groom choice. John Charles antique rose 26645 jacquard floral flute hem dress. 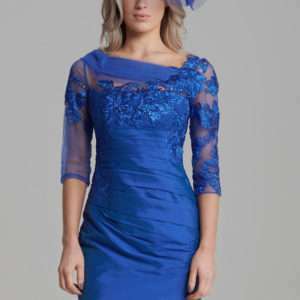 Classically timeless and elegant mother of the bride or groom dress. Features soft stretch floral jacquard print fabric with illusion satin trim v neckline, hemline and sleeve detail. The flute hemline h=adds a floaty elegance. Irresistible IR3029 full skirt bardot tea dress. Features very flattering and feminine bardot neckline with little pearl embellishment detailing. The full skirt is netted underneath to create the tea style swing style to let you move with ease and freedom on your special day.